Idyllic, humbling, tranquil, haunting, and horrifying are just a few of the words that I think of when trying to explain the Gettysburg Battlefield. The only interruptions to the peace and serenity of the battlefields is the sound of chirping birds and gentle breezes rustling through the trees. Even with the hundreds of other people touring on this beautiful spring day, this place was so quiet. After visiting the Gettysburg National Battlefield Museum and Visitors Center, and heading into downtown Gettysburg to see the harsh toll that civilians dealt with at the Shriver and Jennie Wade Houses, we headed into the grounds of the battlefield. It is a sobering experience heading through the battlefields after learning so much about what happened there. We highly recommend getting a decent primer of the events at these places that put a face to the human toll of these battles. It is hard to imagine the sheer horror that took place in these killing fields. Lincoln likely saw this building as he was delivering the Gettysburg Address. This building was converted into a field hospital in the days following the battle. For the residents of Gettysburg, the battle never ended. The hot summer days following the skirmishes were filled with agony, disease, and death. Many of the men were never identified because neither government took the proper care to inventory each soldier. The only thing that Gettysburg residents could do was hope that the wounded men that they were nursing could pull through, or at least identify themselves in some way, so that the next of kin could be notified about loss of loved one. Idyllic farm land, filled with crops and fruit orchards, occupied what became the area of the battlefield. It is difficult to even imagine the horror of the farmers watching their land get decimated by battle. It would take years until Gettysburg could get even close to where it was before. The stunning Pennsylvania monument out in the distance. There are hundreds of these grand granite monuments that memorialize the different regiments that fought, and what happened in each specific spot. It is haunting to see how many casualties are marked on these hundreds of granite monuments throughout the battlefield. The Pennsylvania State Memorial is a stark reminder if the magnitude of this battle. The memorial commemorates the 34,530 men that served from Pennsylvania alone. At 110 feet tall, with an observation deck on top, this is the largest monument on the battlefield. Each of the sides measures in at 100 feet, with giant bronze tablets with the names of every Pennsylvanian that served in the battle. Brit reading through the names. It is mind boggling how many young men fought in this battle, just from Pennsylvania alone. One of the most startling things about the entire journey through the battlefields is the thought that this canon is the last thing that tens of thousands of young men saw throughout the war. The thought of that is what makes war become real to me. Seeing that and substituting out tanks, missiles, IEDs, and fighter jets, the toll of war becomes real. When I think of how traumatic it was for my grandfather to open up about what he saw in World War II, I think of the wounds that these wars inflict upon us. When you see these weapons, and then you see the scores of names written upon tablets throughout the battlefield, and when you see the names on the headstones in the National Cemetery, things become real. War is not about the dates or the numbers, it is about the human cost. I never saw as many ladybugs in one place as I did at the monument. Athena, the goddess of victory and peace. It was created from 7.5 tons of melted canons by sculptor Samuel Murray. It is difficult to envision the pit of despair that this battlefield was during and after the battles. As soon as you get outside of Gettysburg you see endless fields of crops and fruit orchards in what is dubbed the "Apple Capital of Pennsylvania." The battlefield sprawled over farmland and wrecked the livelihoods of so many citizens of Gettysburg, right in the middle of growing season, ruining their crops for that season, and subsequently ruining this land for future farming. Bronze plaque at one of the points on the observation tower, pointing in the direction of nearby landmarks. The monument has four giant marble archways that lead into this spectacular dome area. As we walked away from the Pennsylvania memorial, this hawk was soaring over us. Our next stop was at the Confederate Avenue/Longstreet Observation Tower. This 75 foot tower dates back to 1896. A group of Boy Scouts was just leaving the tower as we entered. A look over the battlefield from the southwestern end. This view would have the union soldiers facing directly towards us. The spring greens and flowers blooming with the start of the season. Looking towards the US Regulars Monument and the 60 foot Culp's Hill Observation Tower poking out over the trees. Little and Big Roundtops. We will be climbing these next. I really felt at peace looking out over everything at the battlefield from this vantage point. This spot had the clearest view of the battlefield area. Here is a view of the Eisenhower Farm, where former general and president, Dwight D. Eisenhower lived out the rest of his years, just seventy miles west of his ancestral beginnings in Pennsylvania Dutch Country. A candid photo of me from Brit. As you can tell, I was having a ton of fun taking photos. The shadow of the 75 foot observation tower on the battlefield below. Looking towards Little and Big Round Tops. This view would be looking right towards the heroic and oncoming Union lines. Our next adventure was going for a hike up Big Round Top. An odd feeling of serenity came over me as we partook in one of my favorite pastimes, hiking. There was a severe loss of life in this location during the war, but there was something soothing about the sprouting leaves, blooming flowers, cool breezes on a mild day, and the views over the battlefield. If you are looking to get away from the hustle and bustle around the battlefield, this is the spot to go. Here you can be one with nature and contemplate what you have seen so far. The details, memorials, and more can be challenging at times to comprehend in regards to the horrific cost of death. The hike up Big Round Top is an quiet escape in nature and a nice moderate level hike. There are a number of memorials throughout the entire hike and the area is a great place to observe wildlife and more. We highly recommend hiking Big Round Top. Here you see a nice elevation change in the trail. I love getting the blood flowing in a nice ascending hike like this. I also love exploring areas at this point of the year, when the seasons are changing. 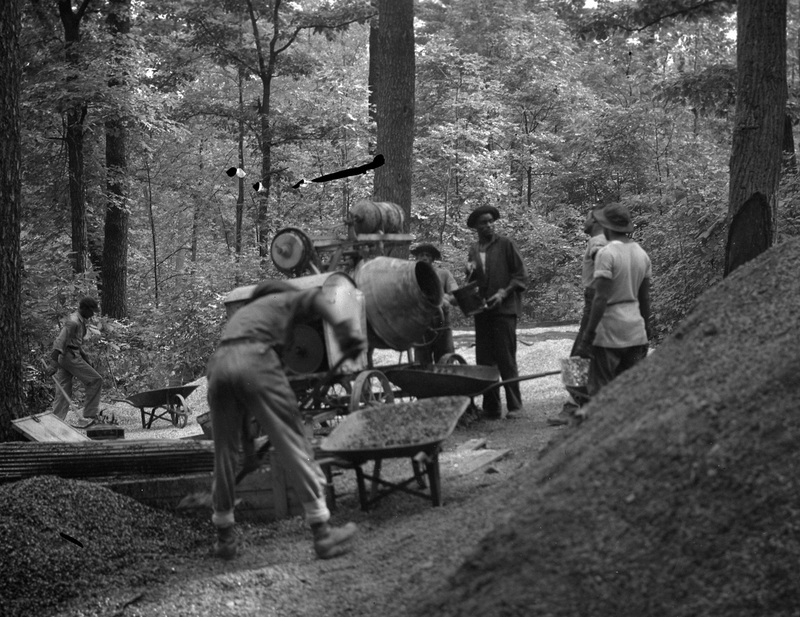 The hiking trail up Big Round Top is one of the projects that the CCC workers participated in. 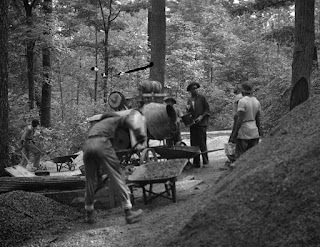 As I mentioned in the post regarding the Museum and Visitors Center, much of this work was completed by the first CCC camp to go under black leadership, a spectacular stride in the fight for civil rights. This was a big deal, for it would take the better part of more than three decades for the 1964 Civil Rights Act to get passed. The symbolic significance of this is huge as well, for close to 75 years before this moment, during the Battle of Gettysburg, there was practically no chance for a black individual to ascend into a leadership position of any sort, or to control his or her own destiny. The CCC was a terrific program that I would personally love see brought back, to help improve our communities, instill discipline, and to employ the youth of our generation. Instead of young men being enlisted to carry rifles on their shoulders into battle, they were enlisted to carry shovels for the betterment of our community. We still reap benefits from these projects close to 80 years later. This photo comes from the Center for Civil War Photography. Their Flickr can be found here. Brit spotted a butterfly! There were many butterflies out thanks to the blooming of the spring flowers and flowering trees. As Brit and I were approaching the butterfly, we were also impressed by this landform's rock formations. In the midst of all of this natural beauty were these memorials to the men that lost their lives in this particularly bloody location. The 119th Regiment from Pennsylvania erected this monument in memory of the unit and their lost members, way back in 1885. We hiked back down and continued on our tour to Little Round Top. Here is the "castle" dedicated to the 12th and 44th Regiments of New York. This is the largest regimental monument on the battlefield. It even has a stairway that leads towards a small observation deck. It is located atop Little Round Top and was built in 1893. At 44 feet tall and 12 feet wide, the widths are an ode to the numbering of the regiments. Here is the view from Little Round Top into the "Valley of Death." Spectacular views. It was a perfectly mild day, but with direct sunlight, the day felt pretty warm. I can only imagine the heat they dealt with during battle in July. Looking over the barren "Valley of Death"
At this point I felt the most humbled and horrified about the violence that occurred in this valley. This immense valley was once filled with young men that would never see their loved ones again. Words escape me to even imagine the feelings of all involved parties. This man was as enamored with the beauty as I was. He was in the final stretch of the completion of his work of art. Now we continue on our tour to Culp's Hill and climb up the 60 foot observation tower, but not before checking out the Pennsylvania Monument again. The Culp's Hill Observation tower is nearly a mirror image of the Confederate Road/Longstreet Observation Tower. It was also built in 1896, but measures just fifteen feet shorter than its counterpart across the valley. This was the strategic right flank of the "fishhook" strategy that they employed in fighting off Pickett's Charge. This was essentially the barbed section of the fish hook, and it was critical to victory. It was said that 227,000 rounds were fired from this spot. With how heavily wooded this area was, some trees were completely sheered off. Other trees had rounds stuck within their trunks and branches. Another candid shot of me. The Gettysburg National Battlefield Museum and Visitor Center. The memorial for the 7th Indiana Volunteer Infantry Regiment. I love the marble cannonball! Here is the view from the 25 foot Oak Ridge Observation Tower. This one was built at the same time as the other two fire tower style observation structures in the park. It also dates back to 1896. In 1960 it was lowered to this height. Once upon a time, this ridge was heavily wooded. On the first day of battle, the armies met at this spot. The oak themed memorials in this spot are my favorites at the battlefield, for intricacy of the sculpting, yet their simplicity is being themed to oak trees. Looking towards Gettysburg College, and the borough in general. From here we continued into Seminary Ridge and then headed out through the Gettysburg and Adams County countryside and onto the Lincoln Highway. Finding words to describe this battle are difficult. Even with the backstory, it seems unreal. It is difficult to imagine the horror of all involved parties. We can learn so much from these battles, with the primary lesson involving an understanding of the tremendous human cost of war. There are many ways to explore the battlefield, whether it be by bicycle, horseback, bus, and more. Or if the ghost tours are your thing, there are multiple options for that as well, with After Dark Investigations, Ghosts of Gettysburg, and the Mason Dixon Paranormal Society.